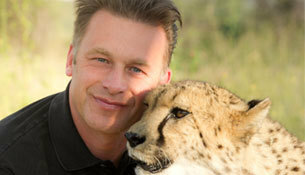 TV presenter and respected naturalist Chris Packham is set to inspire delegates at BSAVA Congress as the keynote speaker on Thursday 6 April 2017. With an enduring passion for wildlife and conservation, Packham will share his concerns about extinction and ideas for inspiring young people to get involved in animal welfare and conservation. Chris Packham follows in the recent footsteps of Alice Roberts, Mark Beaumont and Richard Dawkins, presenting a keynote lecture that entertains and inspires delegates on the first day of Congress. His interest in wildlife began before he could even speak, and his parents encouraged the interest in the ladybirds and tadpoles in their back garden in Southampton. After a degree in Zoology and developing an interest in photography, Chris began his presenting career with the award winning Really Wild Show in 1996 and his recent credits include Inside the Animal Mind, Nature’s Weirdest, The Burrowers and Secrets of our Living Planet. He currently presents Springwatch, Autumnwatch & Winterwatch (BBC Two). Chris Packham’s keynote is free to attend for anyone with a lecture pass to BSAVA Congress 2017. Registration is now open for Congress here with early bird rates available until 31st January 2017.